Reset your internal clock, beat jet lag, or simply boost your mood with these blue light glasses. They deliver good-for-you, blue-turquoise light that mimics natural sunlight which is proven to help regulate your sleep and mood. Feel more alert, sleep better, and thaw winter blues in as little as 20 minutes. 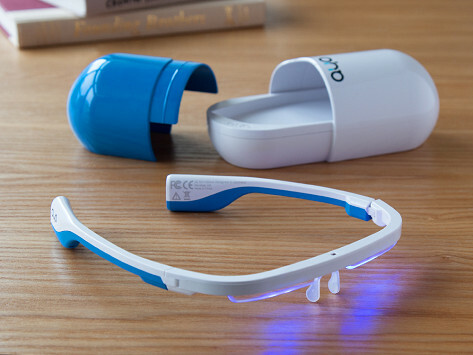 Dimensions: 6.8" x 3.1" x 2.6"
The blue light glasses and app from AYO work together to get you feeling and sleeping better. They use technology based on research and studies performed by leading institutions for more than 20 years. 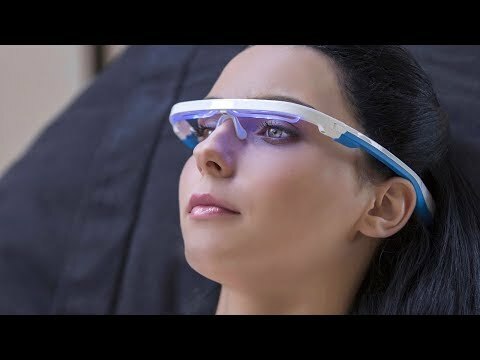 A few of us tried the glasses and were pleasantly surprised with how relaxed and energized we felt after a session. You can customize your own experience with the GoAYO app. Input info—like travel plans and sleep patterns—to determine the best time for you to wear the glasses. This specific shade of good-for-you healthy blue light mimics natural sunlight (which actually contains a blue-turquoise shade) that is proven to help reset your internal clock so you can conquer things like jet lag and seasonal changes. A 20-minute session during the day can make you feel more awake, help you sleep more soundly at night, or serve as an everyday mood booster.